instaGrok is a very promising new search service that I learned about from Joyce Valenza during my time at Discovery's Beyond the Textbook forum. At first glance instaGrok appears to be a new version of Google's old Wonder Wheel service. But after investigation you'll see that instaGrok is more than just web of suggested search terms. You can use instaGrok to search a topic and quickly get lists of facts on that topic, links to information on that topic, videos, images, and quizzes on the topic. If you want to refine or alter your search, just click on another term in the web of search terms. If the results that you are getting are too difficult to comprehend or are too basic, use the difficulty slider to change the results. When you find materials that are useful for your research you can pin them or add them to your instaGrok journal. You can add notes to those links in your journal as well. 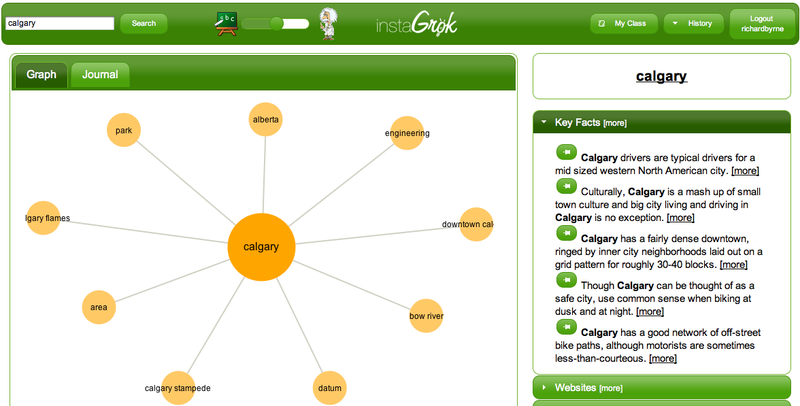 instaGrok could be a fantastic tool for students who are struggling to refine a research topic. It also appears to be a great way for students to organize the useful information that they find while conducting their research.